Group chat is now the backbone of millions of businesses - from small teams to Fortune 500 enterprises -. The first service that comes to mind is Slack, the one that started it all. But Slack is not perfect: the app is well-known for using too much RAM and making your laptop fan whirr, its poor security practices (signing in with a 'magic link' trades security for simplicity). And when Slack is down (which does happen sometimes), the whole business world seems to halt to a grind, leaving remote workers stranded on Twitter, incapable of any communicating with their team. Even Google is after the business messenger crown, with its new app Hangouts Chat. But one thing is often neglected with these group messaging apps: encryption. Slack does not encrypt messages. How would you feel if your company trade secrets were leaked on the internet? Gone is the artificially pixellated font. Instead, the new look of Semaphor is aligned with SpiderOak's cloud backup product with sleeker blue UI elements, sans-serif fonts and smooth animations when switching to another page. Semaphor used to have a free plan where your message were deleted after 30 days. This free plan had limited functionality compared to the full paid version. Starting with Semaphor 2.0, the free version has all the features of its paid counterpart but is now limited to 5 users. If you have more than 5 users in your team, Semaphor is 10 USD/month/user. You're not limited in terms of messages, file retention and sharing are not limited, and you can create as many channels as you want. The only limit is the size of single files: 2GB. For comparison, the size limit for uploading a file is 1 GB on Slack. Total storage is not limited on Semaphor, whereas on Slack you only have 2GB on the free plan and 10GB on the paid plan. Signing up without an email was possible with the previous version. 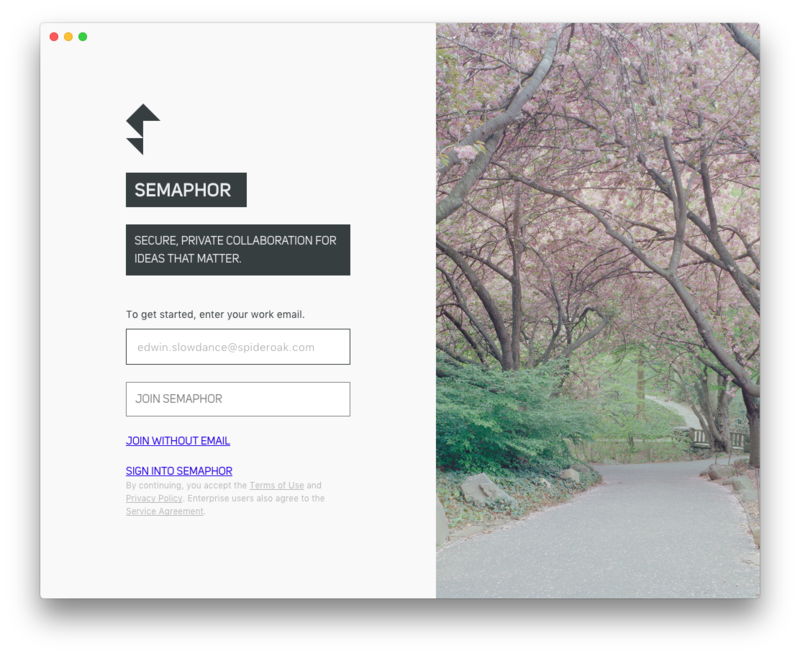 But in Semaphor 2.0, a working email address is now required to sign up. Note that if you previously signed up with a username only, you won't be able to login directly in the new update. A fix is on the way, but in the meantime, the dev team suggests upgrading from a previous version of Semaphor. While Slack does encrypt data during transit and at rest, encryption is not end-to-end. End-to-end encryption is a type of asymetric encryption that protects data in sucha a way that it can only be read on the two ends: the sender and the recipient. End-to-end encryption eliminates the risk of MiTM (man in the middle) attacks. No third party can access the content of the messages sent on Semaphor. This is not the case on Slack, as the encryption is only between your device and Slack server, and on their servers. Even though they claim to be "using FIPS 140-2 compliant encryption standard" for data at rest, with Slack your messages could still be intercepted. Unlike Slack, Semaphor has been created with security in mind from the start. This is why Semaphor 2 is based upon private blockchain technology, as opposed to the previous versions that used a simpler hashchain instead. Moreover, Slack's prime directive is not privacy. They describe themselves as the place 'where work flows. But do you know what else flows? Your private DMs. Recently, Slack changed their policy about how they handled access to private direct messages. Now, bosses can read their employee's DMs without any prior consent. Slack is well-known for all the apps and services that can be connected. You can have notifications for any incident in your server monitoring, notifications for any mention on the internet, sale or any other business-related event. Bots can connect your company's Slack to numerous SaaS. Some are more useful than others: Trello and Airtable integration can sreamline your work process. And you can even let your whole team know what you're listening right now by having Spotify automatically update your status message. Semaphor doesn't have all this variety of connected services. But that might change in the future, as a boilerplate for Semaphor bots is available on GitHub. Clicking on an image in Slack opens it in a kind of overlay, which allows you to preview it without having to download it. With semaphor, you have to download the image to display it in full screen.